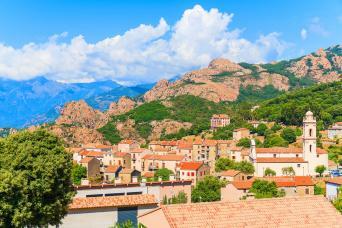 The village of Calenzana in the north of Corsica not only is the start of the famous GR20. Also the "Tra Mare e Monti" trail sets off in this village. This trail, as the name suggests, combines sea and mountains. The first two days the trail goes through forests and mountains. Stages three and four both finish at the seaside. Then the trail turns into the mountains again, passing villages at regular intervals. The southern path, Mare e Monti Sud, can be used to connect two other trails: Mare a Mare Sud and Mare a Mare Centre. Begin and end of the trail are at seaside resorts and in between are the mountains. Summers are hot and less convenient for this hike. Better choose this trail in spring or autumn.